Understanding color theory and how color combinations work together is one of the keys to successful home interior design. Color accents add some excitement to the neutral-colored fireplace. Color is one of the most powerful and effective tools for changing the appearance of a room. It can visually expand or shrink a space, raise and lower ceilings, and even influence the way you feel. Whether you are staging your home for sale, or redesigning for your own satisfaction, a better understanding of color theory will give you the confidence to select paint colors, fabric samples, and accessories that will complete your home decor. Don't settle for stark white walls in every room-- this can make a home feel cold and unwelcoming. Your goal, when planning a home sale, is to create a warm, welcome environment for home buyers. If you're planning to stage your own home, select color combinations that harmonize well with each other and flow from room to room. For example, if you can see your dining room from the kitchen, paint each room the same neutral color, varying shades of that color, or in coordinating colors. Avoid faux wall finishes like sponging, glazing, stucco, or embossing, styles too taste-specific to attract that larger audience of home buyers you need. See interior colors for home staging. Taste Specific: A style that appeals only to a small audience. For home staging, you want your home to appeal to a larger number of home buyers. Color theory knowledge isn't just about choosing successful color schemes. It's also helpful to know the effect that color can have on our moods, the temperature, your blood pressure, metabolism, eyestrain, and even the way you see sizes and shapes. We all respond to specific colors differently, for instance, a cool blue may be relaxing for one person, yet depressing for another. It's important to consider the use of each room when planning your home design. You need to ask yourself what kind of mood you want to create in each space. Restful colors in a bedroom may not work as well in the kitchen, for instance. Warm colors are good choices for active rooms, such as kitchens, dining rooms and children's rooms. Cool colors are successful in restful areas, like bedrooms and bathrooms. Cool colors - Cool colors, (blues, violets and greens) work well in bedrooms because they absorb light instead of reflecting it. The room will “feel” cooler as a result. Plus, cool colors recede and can make a small room seem larger. Cool colors will effectively reduce the heat in rooms that are too hot in the summer. Cool colors can be used in rooms that you intend to be calm and tranquil. Warm colors - Warm colors, (reds, yellows and oranges) advance and can make a large room feel smaller and more inviting. 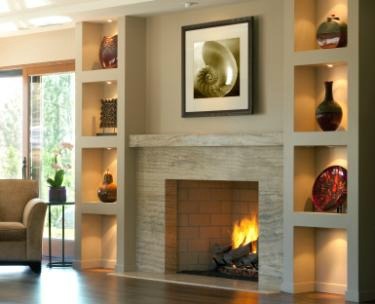 Warm colors reflect light, so that walls will let off heat into a room. Warm colors are usually brighter and work well in rooms that lack natural light. If you have an overly large room, try painting it in a darker color with warm undertones; this will make your room appear cozier. Warm colors are good choices for dining rooms and kitchens. Lighting and color - The type of lighting a room has will determine the "temperature" of paint colors you will want to select. North-facing rooms should be painted in cheerful warm colors to offset the pale light. South-facing sunny rooms have a bright light that can be tempered by painting in cool or neutral colors. Even a dark windowless room can be lightened up by painting walls in a warm bright light color. Always try paint samples on a wall first before you commit yourself to a color. Paint colors will change under different lighting situations, and you may decide that you don't like the result. Colors that look great under natural lighting may look washed out under artificial lighting at night. Red - Red makes us think of valentines, fire, love and passion. This color will actually increase your heart rate, so if you have high blood pressure, avoid painting your walls red. Red is a stimulating color and works well in rooms where a lot of mental activity is going on, such as an office. It’s also an attention grabbing color--many women wear red lipstick for that very reason. On the downside, the color red and similar warm colors can evoke feelings of hostility and rage in some people. Blue - We see it in the ocean, the sky, beautiful Himalayan poppies; blue is certainly a calming and restful color. It will actually lower your blood pressure and when used in bedrooms, will help you settle down for the night. Reversely, the color blue can also induce feelings of sadness and depression. Hence the song, "I feel Blue." Violet - The color of royalty, violet is a rich, confident and powerful color. In pale tones, violet can be relaxing. Violet paint colors work well in bathrooms and bedrooms. It is said that people who suffer from depression should avoid violet, especially in darker shades. Brown - Chocolate, earth, coffee; this is a comforting color. Brown is a neutral color that can be incorporated in a variety of decorating schemes; it goes so well with most colors. From walls to accessories, brown is a versatile color for use throughout the home. Orange - Orange is a cheerful, warm and active color. If you enjoy entertaining, use orange paint colors in your gathering places, as the color stimulates people to feel more sociable. Yellow - Yellow is warming, like sunlight, a happy color that will brighten a dull mood. Use sunny yellow paint colors in your kitchen or craft room, as it is supposed to put you in a creative mood. On the other hand, if the yellow is too intense and bright, it's liable to make some people feel anxious and distressed. Some people recommend painting a guest room in a blinding, noxious yellow to keep guests from staying too long! Green - If you have a lot of stress, paint your walls in hues of green. Green is a relaxing and comforting color that will help ease your anxieties. Who doesn’t love the color of nature and desire to bring it inside? 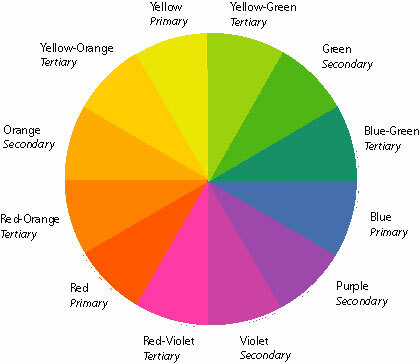 The color wheel, or color circle, is the basis for color theory-- it shows the 12 colors of the rainbow in circle form. Understanding color principles is the key to creating a beautiful home interior. The color wheel represents the bars of color that light produces as it passes through a prism. When light hits an object, the object selectively absorbs and reflects wavelengths--a blue bedspread reflects the blue wavelengths of the spectrum. Where there is no light, we see blackness. 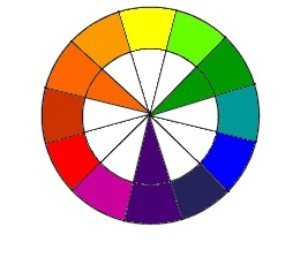 The color wheel on the right is a diagram showing the relationship between color hues around a circle. The color wheel is based on red, yellow and blue and consists of warm and cool tones. The color wheel has been around since 1666 thanks to the genius of Sir Isaac Newton and gives us a visual guide of color theory. The primary colors are blue, yellow and red. All other colors derive from these. The primary colors are red, yellow, and blue. You can’t get these colors by mixing any other colors together. All other colors stem from these three hues. 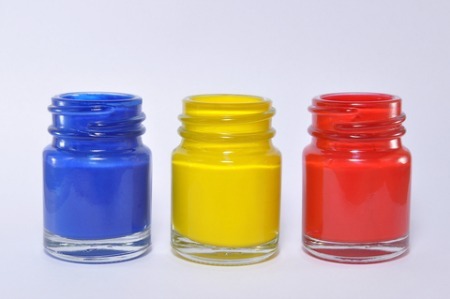 Primary colors are placed equidistantly around the color wheel. Using these colors in decorating schemes results in an energetic and lively room design. You often see elementary schools decorated with primary colors. Violet - Made from blue and red. 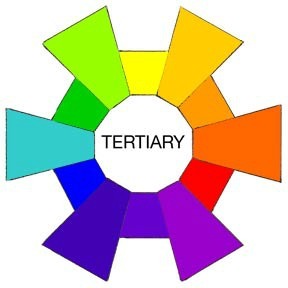 Tertiary colors are created when mixing equal amounts of a primary color with the nearest secondary color on the color wheel. 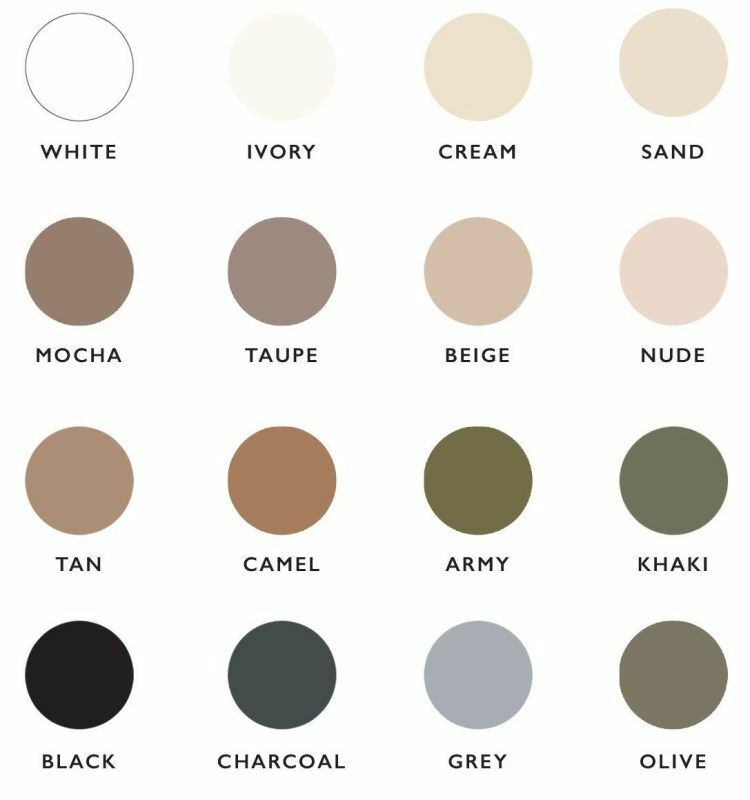 Neutral colors are black, white, gray, brown, beige and taupe. Earth tones, or colors that occur naturally in nature are considered neutrals as well. Neutral colors are easy on the eyes, appeal to most people, and work well alone or in conjunction with other colors in any home decor. 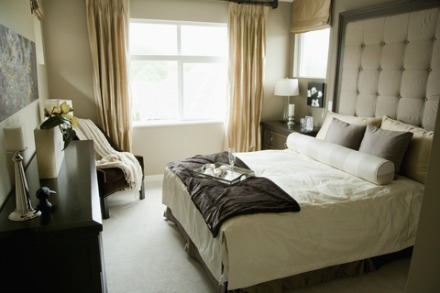 Neutrals are the favored choice of home stagers because of their universal appeal. How do you design a room around neutral colors? One possible color scheme is to focus on one neutral, like a white-on-white look. You may find up to 20 different variations of white, from ivory, bone, cream, and white in this interior color scheme. Home staging shouldn't be bland-- you don't want to bore home buyers! Plus, you want them to remember your house over all the others. You can avoid total blandness by mixing color, pattern, and texture into your home design with accessories, upholstery fabrics, and window treatments. Be sure to have a good balance of light, medium, and dark tones in a room. Avoid placing all the dark or colorful elements on one side of the room, balance them out. Dark colors are visually "heavier" than light, so this would upset the balance of the room and prevent your eye from moving by stopping "visual flow". See home interior design rules﻿﻿. 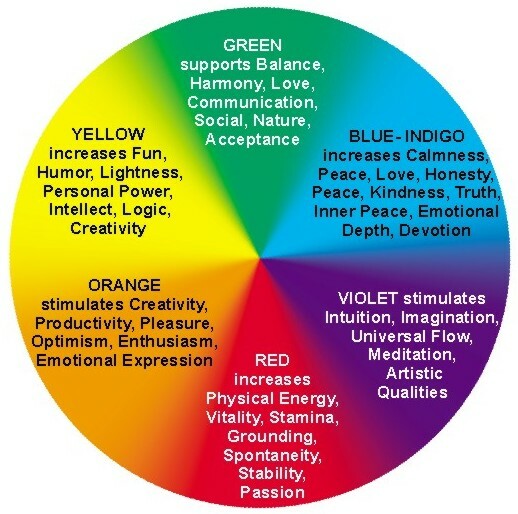 Hue - Hue simply means a pure color that doesn’t have any black or white added to it, as in the color wheel. It can also describe colors that are made when you combine other pure colors. For instance, you can describe a color as having a yellow hue, or a orange-red hue. Tints - You create a tint by adding white to a hue. It is lighter than the original color. Shade - A shade is created by adding black to it. A shade will be darker than the original color. Tone - The tone of a color is changed by adding gray or it’s complement. The tone of a color can make a big difference in a room’s appearance. As a rule, lighter tones will make a room appear larger, and darker tones will make a room feel cozier. Saturation - Refers to the intensity of a color and how a color will look under different lighting conditions. It does not refer to the lightness or darkness of a color. Grayscale - A grayscale is a row of neutral colors ranging from white on one end and gradually increasing in value until it reaches pure black on the other end. Understanding color theory can help you stage your home successfully. The use of certain color combinations and techniques can visually lengthen or shorten a wall, raise a low ceiling, or make a small room appear larger than it is. Following are some easy to do color theory fixes for difficult spaces. Pale colors reflect and multiply light, and when combined with lots of natural light flowing in through the windows, can visually expand a small room. Simply painting the walls a light color will appear to push the walls back. Avoid using dark colors, which absorb and deflect light and can make a small space feel closed in. Cool colors appear to retreat. 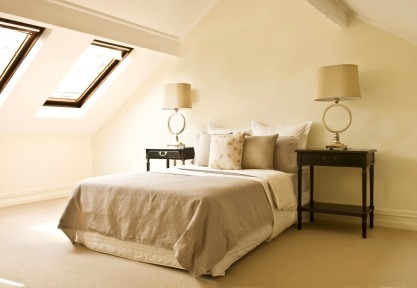 Use pale cool colors like whites, creams, soft grays, greens and blues when staging a small room. Receding colors will reflect light and create a feeling of spaciousness. Light colored flooring will open up a small room. Walls and ceiling in similar colors work in conjunction to visually enlarge a small space. Link adjacent spaces with the same light flooring, or at least the same color if floor materials are made of different materials. Use white or another very pale color on a low ceiling to visually raise a low ceiling. 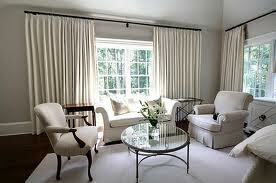 When adding window treatments in a small room, keep them the same color as the walls to avoid contrast in the space. To create a feeling of maximum space, use the same light color palette on the walls, floors, cabinets, window treatments, and trim work. Employ a light hand when adding pops of color, using no more than 2 or 3 colors in a tiny space. Swathing an entire room in white will create a uninterrupted space without breaks of color contrast to prevent the eye from moving on. This home design tips fools you into thinking the space is larger than it is. Abrupt shifts from dark to light will trip the eye. Remove heavy or dark window treatments that can be oppressive and block natural light. Drawing the eye vertically can make a room appear taller than it really is. If you have a low ceiling in your small room, paint subtle wide vertical stripes on the walls, or apply a vertical patterned wallpaper in a neutral tone on the walls. 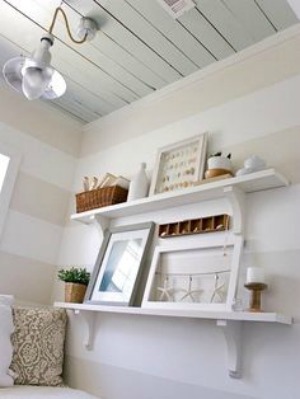 To visually lengthen walls, paint neutral-colored, wide, horizontal stripes on the walls. For oversized rooms that feel cold and distant, paint walls and ceilings in warm and dark color combinations. Dark colors absorb and deflect light and can make a large space feel more intimate. Use color and heavy textures in upholstery fabrics, carpeting, and window treatments. Heavy textures absorb more light, making them appear darker. Lower a too-high ceiling by painting it in a dark color. Bringing the dark color down onto the walls closer to your line of vision will further enhance the effect by making walls seem less tall. For long narrow rooms, paint the end walls in a warm dark color. Because warm colors advance and dark colors deflect light, this will give the effect of "shortening" the room. Be sure to paint the long walls in a soft light color to make them recede in prominence. An analogous color scheme is created when you combine three colors that are side by side on the color wheel. Typically, one color is dominant and the others secondary in prominence. The secondary and tertiary colors in this design scheme are harmonious, and occur naturally in nature. An example of this color combination would be; red, red-orange, and orange, like Fall foliage. Analogous color schemes are used often in interior decorating when a peaceful, calming room scheme is desired. Analogous colors are restful and easy on the eyes. These color combinations can encompass three to five hues with only one primary color. 60% of the room should consist of a dominant color; walls and ceilings. 30% should be a secondary color; upholstered furniture, for example. 10% of your color scheme should be an accent color to provide visual interest to the room, usually in the form of accessories. Analogous color combinations work well in informal rooms such as, bedrooms, family rooms and dens. Complementary color schemes use colors that are direct opposites on the color wheel. These color combinations work best when one color dominates over the other. The colors opposite one other on the color wheel complete and enrich the other. An example of a complementary color scheme would be red-green, blue-orange, and yellow-purple. If you get the color saturation wrong, the colors can add tension to a room by vibrating off each other. The effect can be jarring, so a deft hand is required when designing a room using these color combinations. 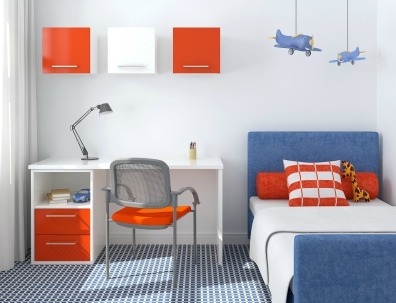 Complementary color schemes work well in formal rooms like dining or living rooms or in contemporary style rooms, such as the children's bedroom pictured above. See how the orange in this room pops next to the blue. Monochromatic color schemes are the most successful room design for small spaces. This color design employs a single color in varied tones, shades and tints. The one color can vary greatly in value and saturation, creating a sophisticated and restful space like in the bedroom above. Done incorrectly, a monochromatic color scheme can be bland and boring. Monochromatic color schemes rely heavily on textural elements to create interest. This low-contrast color scheme is the most successful color palette for small room design. Monochromatic color schemes create harmony, visual cohesion, and a sense of relaxation in any room, making it the perfect color scheme for home staging. Any color can be used in monochromatic room design, but typically, colors used for the purpose of home staging are whites, beiges and grays. Many people may yawn at the idea of a room that is basically designed around one color, but by incorporating variations in tones, textures and accessorizing with glass, objects from nature, greenery, etc., you can create a feeling of spaciousness and sophistication. Monochromatic room designs also creates a perfect backdrop for displaying artwork. This sophisticated color scheme uses one color with very little variation in value, saturation and brightness. The monotone color scheme can be calm and soothing, and has the effect of enlarging a space, making it an ideal design for small rooms. This look can be saved from total blandness by accessorizing with subtle pattern, plants, glass, metals and textural elements in fabrics. Like the monochromatic style, the monotone look also creates a great backdrop for artwork and collections. This is why you usually see art galleries painted in white, to allow the artwork to stand out. White is typically used in combination with monotone and monochromatic color schemes, in the form of window trim, molding, doors and door casings. Watch the informative video below by SessionsOnline about color theory and choosing color schemes by using geometric shapes within the color wheel.